March is the first month for a series of Colour Challenges for this year. I’ve picked orange for my first Colour Challenge .. I recently learned to like orange through doing Matthew’s quilt and also seeing various friends use orange in their quilts (which are always so bright and cheerful!) .. it’s given me a new perspective on orange which in my head I has always been as “jailhouse jumpsuit orange” .. tends to give it a rather negative connotation me thinks. 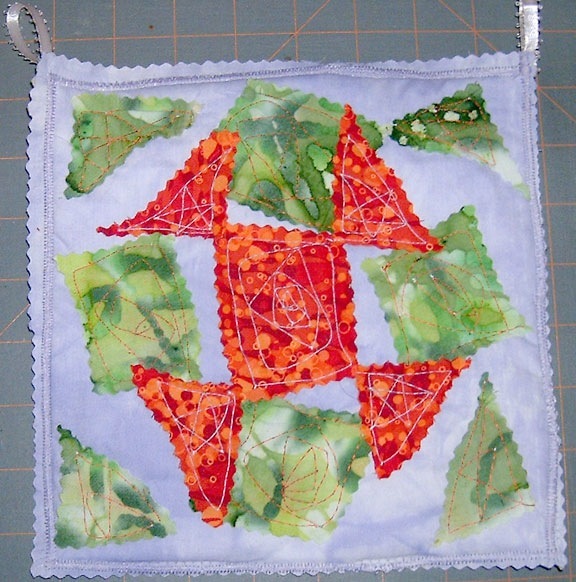 I did two challenges with orange – the first one was an abstract quiltlet using orange as the focus with 2 of my favourites – purple and green. The orange is from an FQ that I bought just for the purpose of stretching my colour muscles, the green is a batik with leaf shapes on it, and the lavender is hand-dyed by me. I wanted to do take a traditional block and put a twist on it so to speak. So I took the shoo fly block, used the orange as the central block, green as the background of the block and the hand-dyed as the background. I cut the pieces with my pinking rotary cutter and just tossed the pieces pell mell on my background. The only thing that I wanted to ‘control’ was that the corners of the orange sections were touching .. I do rather like this – I wanted to do a generalized background quilting, but thought it would be too busy if I had done with all the orange and green floating around on it .. I call this Orange Shoo Fly Spring Explosion. I got to thinking, some people might not want to do this challenge as one they would be working in a hated colour and then not know what to do with the bloody thing after the fact. One of the members on OST (Joan – she’s listed under the virtual chaper), runs a block lottery etc for QFK (Quilts for Kids). I suggested that maybe they could get an FQ and make up blocks for QFK as their challenge – well I did both parts of the challenge .. The only thing that Joan wanted was that the fabrics are kid friendly and that they follow the block that was chosen for this quarter .. It was the Tam’s Patch off quilterscache. I used a funky kitty fabric, the hand-dyed lavender and another orange with neat swirly hearts on it .. The orange was less than ½ an FQ and I used scraps for the lavender and orange pieces. 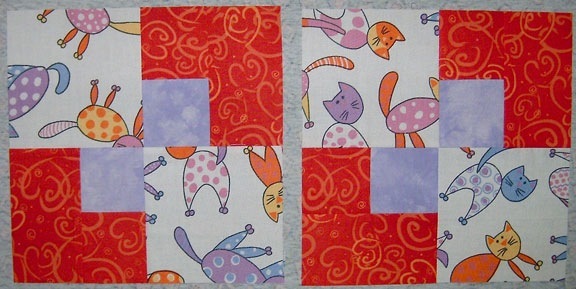 I know that the orange was to be the focus, but with this being a kid friendly block, I rather thought that the kitty fabric would be more in keeping with that theme .. so I used it for the 2nd fabric instead .. and could almost be the focus minus one square .. these blocks too me less than 45 mins to cut out, stitch, press and square .. So I’ve managed to get an abstract quitlet done, stretch my colour muscles, and make up 2 blocks for charity – I feel pretty good about that .. and this all took less than 5 hrs at the most .. and get 4 quilts to my binding pile .. COOL! Now what to do .. big fan – baste?? kitty quilt – quilt?? hopscotch – baste?? Hmmm decisions – decisions ..